The Archbishop of Canterbury has warned that there are extreme forces at work that have turned the Arab Spring into a "very anxious time" for Christians. 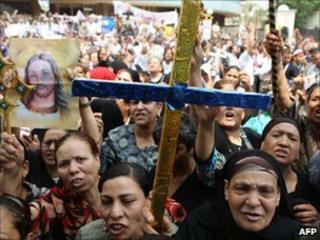 He claimed there had been more killings of Christians and burnings of churches in Egypt than people were aware of. Life was unsustainable for Christians in northern Iraq, and tensions in Syria were nearing breaking point, he added. The Middle East is the birthplace of Christianity and home to some of the world's most ancient Christian denominations. There is no agreed figure for the number of Christians in the region, though some experts believe there are as many as 10 million. In an interview with BBC Radio 4's The World at One, Dr Williams said he was "guardedly optimistic" that the political upheavals in the Middle East and North Africa would bring greater democracy to the region. "In the long term, of course, a real participatory democracy in the region is bound to be in the interests of minorities because good democracies look after minorities," he said. "There is no doubt at all that it is a very anxious time for Christian communities. There have been extremist atrocities already, especially in Egypt," he said. "It is a fairly consistent pattern over a number of months. Although at leadership level in the Muslim community in Egypt there is clear condemnation of this, it's evident that there are other forces at work which of course may not be native Egyptian," he added. He suggested outside elements had entered Egypt from "more traditional sites of extremism", such as Saudi Arabia and northern Sudan, and did not rule out activity by al-Qaeda. "More and more there is the talk of an 'enclave solution' to the problem in Iraq - that is a sort of safe territory for Christians, which Christians and their leaders don't particularly want, but many would think is the only practical outcome now." Even in Bethlehem, the birthplace of Jesus Christ, Christians who had once been in the majority were now a "marginalised minority", he added.